The year: 2006. The mission: routine. Or so U.S.A.F. pilot Bree "Banzai" Maguire thinks, Then she's shot down over enemy airspace, captured and put in bio-stasis. When she wakes, everything's changed. It's one hundred and seventy years later - 2176 - the world is in crisis, and she's a hotly contested prize. Once, Banzai's job was to protect democracy; now a mysterious voice claims she must bring it back. But who will help? Two men vie for her heart. Kyber, her captor, the rich, ruthless Emperor Prince of Asia, has all a man could desire . . . except her love. Then there's U.C.E. SEAL commander and would-be rescuer Ty Armstrong. He has all the right moves - but are they enough to keep up with a woman on a mission? With two such choices, Banzai regrets she has but one heart to give for her country. 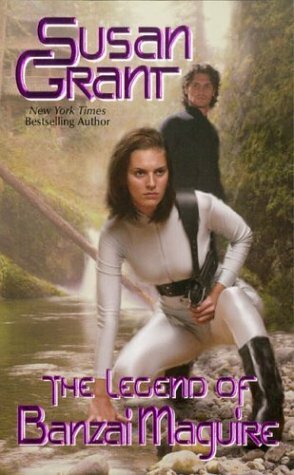 The Legend of Banzai Maguire is the first in a science fiction romance quintet. It was released in 2004 and is no longer in print (except for the fifth and final book, which is being rereleased by Dorchester in June 2012). However, I was able to track this series down on eBay, and - although sometimes a little cheesy - it was actually pretty good. We start out with Bree "Banzai" Maguire in 2006 just before she goes on a flyover mission for the Air Force. Fast-forward 170 years, and Bree is rescued from stasis by Ty Armstrong, a S.E.A.L. commander for the U.C.E. But before Ty can take Banzai home, they are ambushed by forces sent by Kyber, the Emperor Prince of Asia. Susan Grant tries to play Prince Kyber as a legitimate contender for Banzai's heart, but I just never bought it. Ty was such a sweetheart; he was perfect for her. Gini Koch was my first science fiction romance author, but Susan Grant was my second. This book is a great introduction to the series, and I have high hopes for the rest of the books!